ETP Group presents ETP #Futuretail – The Omni-channel Transformation of Retail Businesses. Simply operating multiple retail channels does not constitute an omni-channel strategy, unless done right. Today, customers may start in one channel and switch to another as they progress to a definite buying decision. Omni-channel implies making sure these complex ‘hand-offs’ between channels must be effortless for the customer. 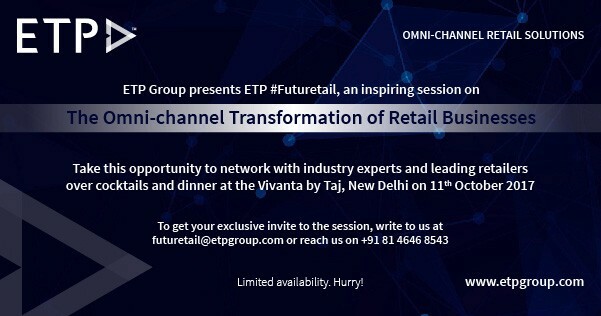 ETP presents ETP #Futuretail India 2017, an inspiring session on ‘The Omni-channel Transformation of Retail Businesses in India’ to show how to convert such omni-channel challenges into opportunities. It will be held on 11 October 2017 at the Vivanta by Taj. During the event team ETP led by Mr. Naresh Ahuja, Chairman & CEO, ETP Group will lead discussions on the importance of ‘The Omni-channel Transformation of Retail Businesses in India’. He will shed light on the abundant opportunities at hand for the retailers in this dynamic region by adopting an omni-channel strategy for their businesses as well as share insights on some of the key trends in traditional retail, e-commerce and omni-channel retail. ETP customers will share their learnings and ETP will share its research and technology. Mr. Varun Suri, Solutions Director, ETP Group will present a live demonstration of ETP’s Omni-channel Retail Solutions to establish how ETP can help retailers in India to overcome the challenges in omni-channel retailing. Take this opportunity to network with industry experts and leading lifestyle retailers in India representing several verticals such as fashion, footwear, electronics, mobiles, books and stationery, sporting goods, furniture and home furnishings, over cocktails and dinner at the Vivanta by Taj, Plot No.1, Sector 44, Gurugram, Haryana 122004 on 11 October 2017. This exclusive event is invite only. ETP #Futuretail will continue to drive the omni-channel transformation of retail businesses across Asia-Pacific, India and the Middle-East.